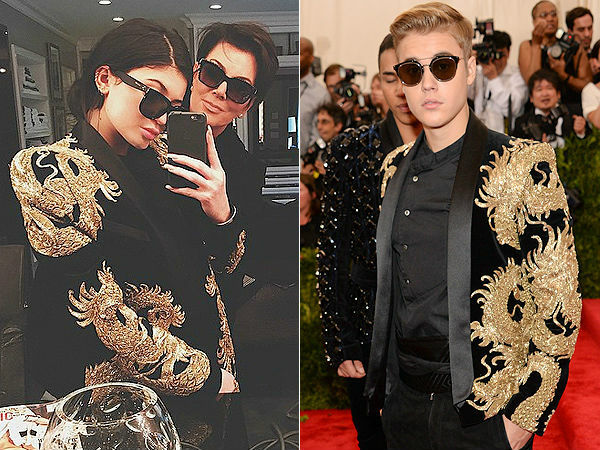 Kylie Jenner shared an Instagram Friday evening, posing in a statement-making blazer that looks just like the one Justin Bieber wore earlier this week to the Met Gala. Justin attended Monday’s Metropolitan Museum of Art Costume Institute Gala, which was themed China: Through the Looking Glass, in a structured black tuxedo topper with elaborate gold embellishment. And it appears Kylie is wearing a version of the dramatic jacket in her Instagram pic. Though her caption clears up any questions we might have had about the two young stars sharing clothes: “lol no I didn’t steal the jacket from justin,” she writes. JB was dressed for the Met Gala by Balmain’s Olivier Rousteing. Justin’s jacket was a one of kind creation custom made especially for him by Oliver Rousteing so I doubt Justin would lend it out.. It was made of real gold bullion! I can see other people wearing copies but there is only one jacket like that in the world and Justin has it. Kylie Jenner tells true,because in Chinese culture ,dragons’re widespread subject.